I don’t know what made me pick up Sterlingware again. After a year or two of experimenting with the formula parser in Inkblot Kaos and Tierazon and a whole bunch of photoshop filters, Sterlingware didn’t seem exciting anymore. Once again, I’d thought I’d squeezed every good thing out of Sterlingware. Sure, like every progam it was still good for making raw material to morph and zap with photoshop filters, but I figured its days of stand alone usefulness were gone. That’s the point when I would usually give up out of frustration and move on to some other program, looking for new horizons. But this time I became fascinated with something that I’m sure I had already experimented with and abandoned: guassian sine dimension 9. What’s weird is I’d seen these before, but at the time, I wasn’t ready for them. It reminds me of the perlin noise images I’ve seen by Samuel Monnier and Paul DeCelle. Although I’m sure these two types of imagery are not related mathematically, they both have that same endless cloud feeling to them, of infinite resolution and unpredictable patterns. Unpredictable. That’s what creativity is all about: making something you haven’t seen before. I used to think stuff like this was garbage. But now I realize I just wasn’t ready for bubbles — back then. 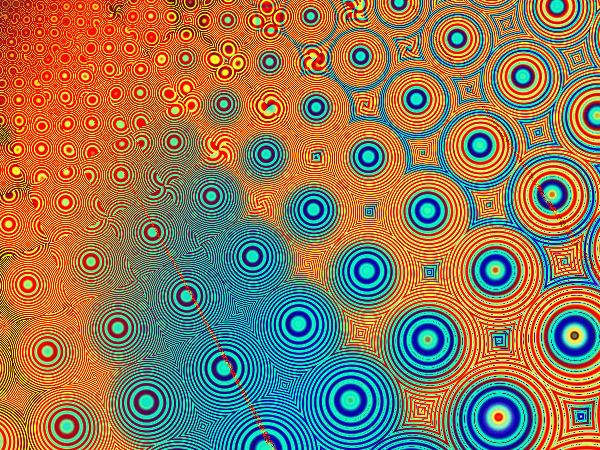 On the other hand the images by Paul, myself and some other (I think Mark Townsend launched this idea…), use non-fractal patterns that are stacked at different scales to produce a fractal pattern. How do your images behave when you resize them ? The images change when resized. This is noticeable when zooming into an image or looking at a thumbnail of one in an image viewer. There seems to be a moire effect, but also something else, like a circular image mapped onto… something. Some circles are chopped off, just like one would chop off the edge of a square piece of paper when trying to paste it onto a curved surface. I’m sure Stephen Ferguson could explain it. I just called them “bubbles” as a handy label, although that probably confuses them with the bubbles/stalks type of rendering. I’m not even sure images like this are really fractal structures unless viewed at a larger scale where one can see the whole structure represented. The moire things are deeply weird. Zoom in, and they’re gone. Also, anti-aliasing can erase them or even create new ones. In fact, I’ll bet printing them out is complicated too. They’re almost alive. “non-fractal patterns that are stacked at different scales to produce a fractal pattern” Actually, the “bubble” images I have here seem to resemble a layered image like that, with a circular wave pattern repeated at different scales and the waves interacting with a moire effect. There is no actual layering of course, because Sterlingware doesn’t do that, although it might incorporate something similar in it’s rendering. more sophisticated programs employ antialiasing to produce super crisp images. One artist’s “poor programming” is another artist’s aesthetic choice. 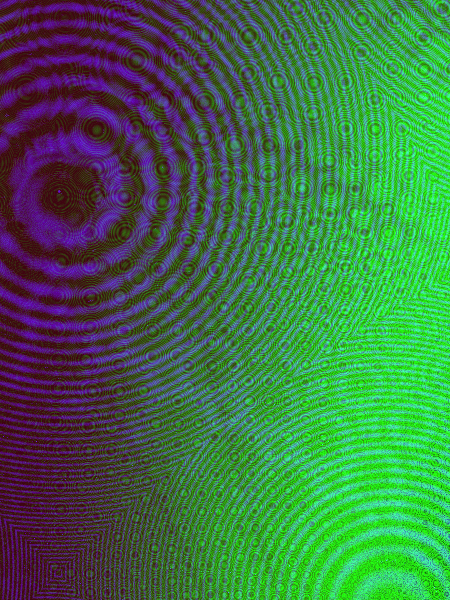 I like moiré patterns and often leave traces of them in images I make with QuaSZ. It’s easy to smooth them or remove them with adjustments to a quat’s values, or kill them off completely with anti-aliasing, but I prefer instead to smudge and blur the “bubbles” in Photoshop. This process leaves artifact remnants of the patterns still slightly visible. the correct way to approach image generation is to put exactly as much data as you can into those pixels as you can, and no more (a bandlimiting filter, this applies equally to audio signals). well executed, deliberately low-fi rendering can be a work of art of course (e.g. the pictures polaroid cameras take are amazing), i just think that in the particular case of fractals – where we lose so much visual quality to extreme aliasing – it pays to take an interest such matters. It looks like the link in my comment above vanished when I edited out a typo.